Ospreys are creatures I’ve felt a bond with throughout my life. We share a common pursuit—stalking and utilizing a hunting approach to target fish. A sharp eye essential for spotting fish, and then it’s a matter of slipping into position to cast. The aquatic, dive-bombing raptor has a few more advantages, like the gift of flight to spot fish from up high and naturally polarized eyes allowing them to see through the glare. As a mere human, I’ve constantly felt frustrated standing on the banks watching fish rise out of reach of my casting abilities or not being able to cast due to vegetation in my casting zones. 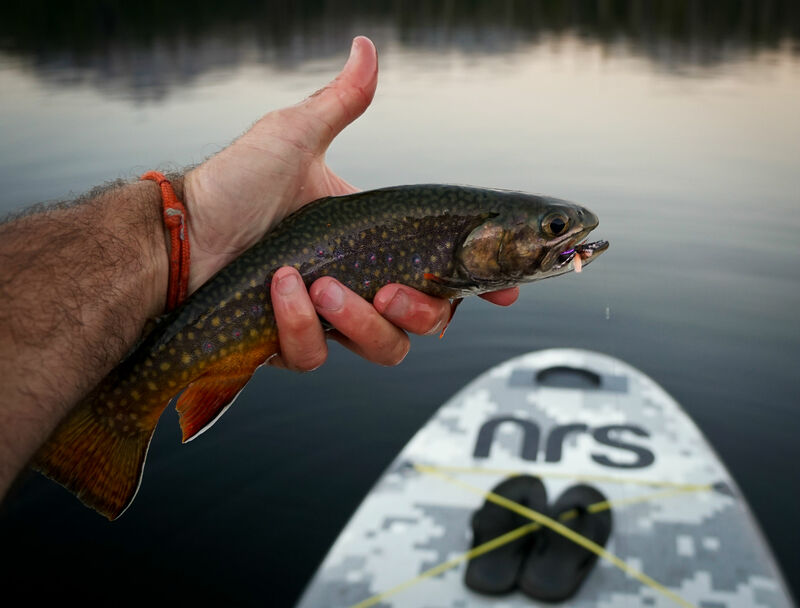 My NRS Osprey standup paddleboard allows me to cruise my favorite high alpine lakes stalking trout from a solitary standing position. And while my stance on a paddleboard doesn’t offer the same level of spotting ability as an Osprey raptor, I feel it’s the next best thing. 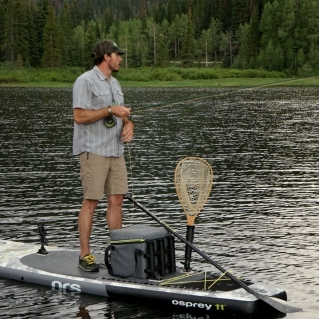 The Osprey SUP alleviates all that frustration. The maiden voyage of my fish-hunting craft was on the waters of Smith and Morehouse Lake, about an hour east of Park City, Utah. 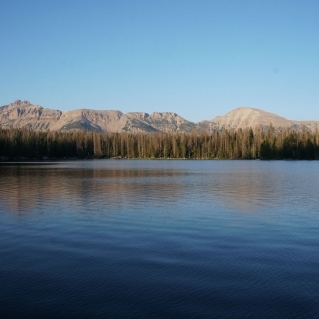 The first time I saw the lake was with a couple of fly fish guiding friends. 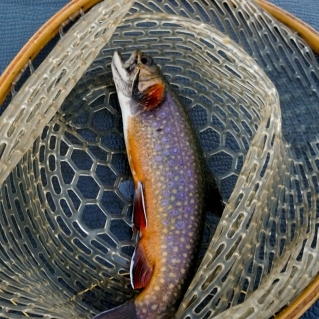 We targeted small graylings and brook trout on micro dry flies in a small pool at the lake’s tailwaters. As I walked the banks, I was awestruck by the scenery—the mountain ridgelines surrounding the lake were stacked with trees and rocky ledges. I knew an evening session on the lake was in order. So one late afternoon, midweek, my friend Matt and I loaded up his rig and drove into the Uinta Mountains. The clouds sitting over Park City began to drizzle as the wheels were turning. We decided to push forward and roll the dice. Hopefully, we’d have different weather at the lake. The gods were in favor of us this day, as the clouds began breaking up 10-15 minutes into the drive. As we pulled up, the final clouds separated, and the sky broke open allowing the beginning of that magical golden light. We scrambled unloading and getting down to the shoreline with our gear. The glassy water was interrupted by the dimples of trout picking bugs off the surface of the lake. 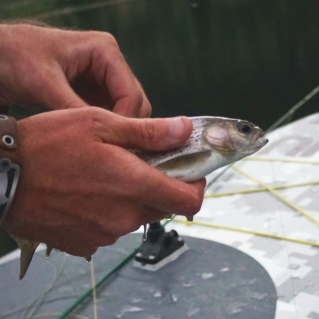 My hands worked efficiently snapping mounts into place, setting the NRS Ambush Tackle bag in place, rigging my fly rod and reel with a foam beetle with white legs and a purple belly with a quick cinch knot on the 6x tippet and off I went. For the next two and a half hours, we worked the banks with the wind at our backs to naturally drift us down long sections, paddling back around and hitting the middle of the lake and keeping a close eye on the fly. Occasionally, we would get that adrenaline dump caused by the sight of an ambitious trout launching its whole body out of the water with a newly pierced lip. 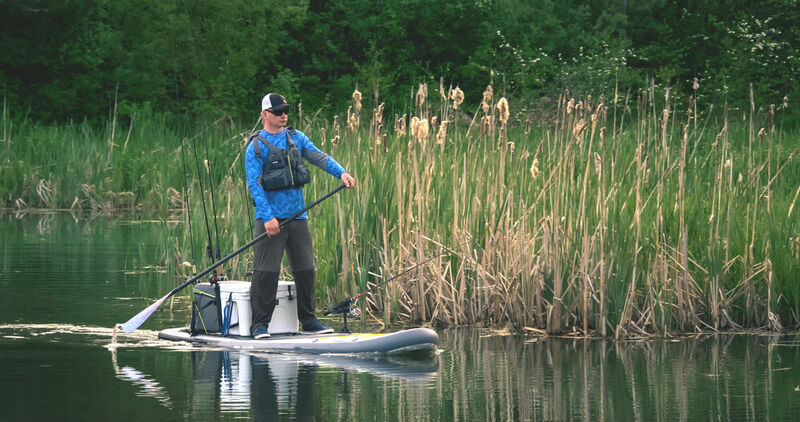 It’s an amazing feeling to watch your line unwind at your max casting ability, plop softly on the surface of a mirror lake and see a fish hit it shark-week style, all from the view of your SUP. To best utilize the Osprey and all its features, the board has to be kitted out. Luckily, NRS leaves the configuring to you, letting you customize your set-up to match your fishing style. I’ve placed the NRS Ambush Tackle Bag directly behind my standing area to store a variety of fly boxes, inflatable PFD, camera, snacks and drinks and other storable goodies. I’ve taken both Scotty and Ram Mount accessories to mount rod holders, cup holders and a net holder to organize gear. I’ve found the rear mounts are perfect for my net and a rod holder. When I placed the rod holder up front, I realized my line gets tangled while stripping line and casting. So, I opted for a drink holder on the front mount articulated forward, which works great. I’m a taller guy, and I’ve been on SUPs that can’t handle the weight of myself and all my gear, but the 11 foot Osprey is not only wide enough—at 34 inches wide—but thick enough to keep my waterline low. And with the ability to inflate to 20 psi, a passing drift boat would have no idea I’m on an inflatable board. With eight D-rings, front and back bungee rigging and molle straps running bilaterally down the length of the board in the rear, the deck configuration allows for a variety of accessories to be mounted. For future multi-day trips, this will be the area I secure dry bags filled with camping gear. But in the fishing mode, I like to have my rod and net holder mounted to keep things simple. 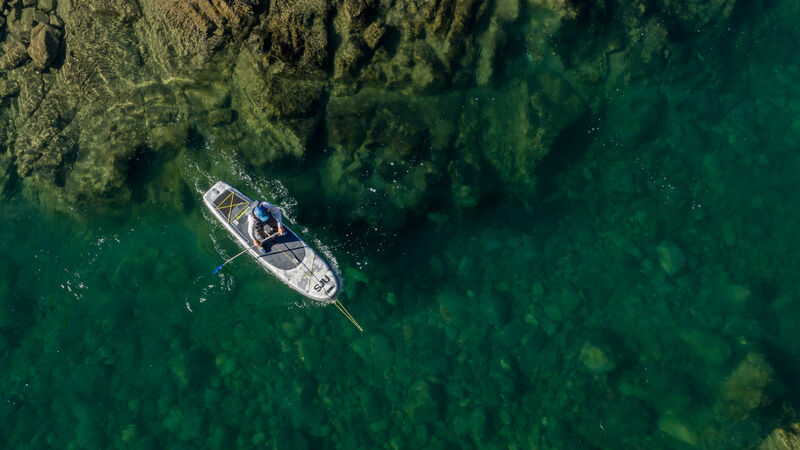 Fishing from a SUP is a special way for me to approach this sport. One of the major advantages is the ability to create a fishing platform where I control all elements. 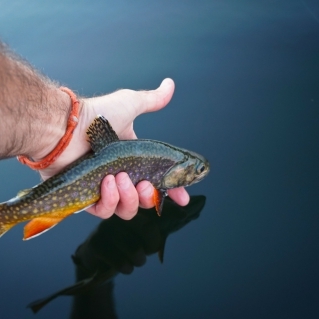 While taking the sticks or leaning into a casting platform in a raft or drift boat is a unique thing, the ability to be a self-sufficient angler on the hunt for trout is highly rewarding and empowering. The calm serenity of an alpine lake mixed with the deep concentration fishing requires, leaves your mind in the absolute moment. For me, that’s what it’s all about. 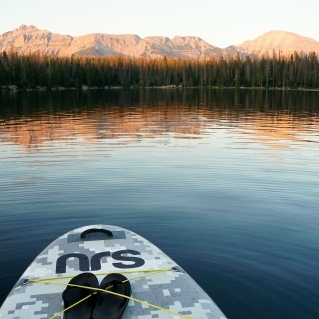 The NRS Osprey is an excellent board to catch a dawn patrol or sunset fishing adventure. Bring your coffee or carbonated beverage to enjoy while the golden light creeps over the treetops and watch the ripples on the water where fish are actively feeding.